As we leave the Tuscan mainland and head for the beautiful island of Elba we pass through the tiny village of Bolgheri. This coastal area has become one of the most interesting and innovative wine regions in Italy with its unique microclimate and proximity to the sea giving perfect conditions for both red and white grapes. While traditional Tuscan winegrowers concentrated on native Sangiovese grapes for the great wines of Chianti, those in Bolgheri were experimenting with French varieties, chiefly Cabernet Sauvignon, Merlot and Cabernet Franc, and producing excellent, high quality wines. Over time they became known as the "Super Tuscans" and could command increasingly high prices. We stop in a fabulous Enoteca (or Wine Shop) in Bolgheri for lunch and of course we have the chance to taste one of the most talked-about local wines. The famous Frescobaldi family own the estate here and make their Ornellaia Bianco white wine using 100% Sauvignon Blanc grapes. 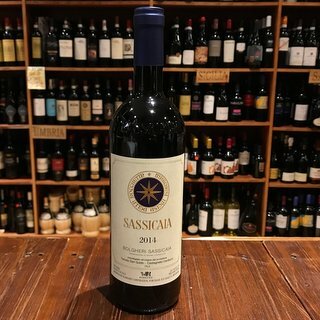 Probably the best-known of the "Super Tuscan" reds is this wine known as Sassicaia, produced by the Incisa della Rocchetta family, with over 80% cabernet sauvignon grapes. It usually retails between €100 - €200 per bottle.